Skateboarding company that makes: decks, wheels, clothing and accessories. Skateboarding company that makes: shoes and clothing. Skateboarding company that makes: Mostly clothing, and very little on skateboards. Skateboarding company that makes: shoes, snowboarding boots, BMX shoes, clothing. Skateboarding company that makes: decks and clothing. Skateboarding company that makes: decks, wheels, softgoods. Antihero makes: decks, clothes. Antihero is a DLXSF company. Skateboarding company that makes: trucks, accessories and clothing. Skate company that makes: boards and logo apparel. Skate company that makes: boards, accessories and clothing. Tony Hawk’s skateboard company, makes: decks, accessories and clothing. Black Label sells: boards, wheels and wearables. Skate company that makes: decks, wheels and clothing. Skate company that makes: Bearings. Skate company that makes: wheels, soft goods and other accessories. Skateboard company that makes: boards. Circa makes: skate shoes and apparel. C1RCA is the part of Four Star Distribution. Skate company that makes: helmets, pads, skateboard rack, slam kit and other accessories. Skateboard company that makes: boards, wheels, clothing. Skateboard company that makes: electric skateboards. Skateboard company that makes: wheels and wood. DC makes: skate shoes, clothing, video, snow sport gear, accessories. Skateboard company that makes: clothes, weels and decks. Part of Tum Yeto company. Decade sells: boards, gear, shoes, clothes, videos. Skateboard company that makes: Footwear, ACCESSORIES, APPAREL. dNA makes: decks, wheels and clothing. Dogtown makes: decks, wheels, clothes and accessories. Skateboard company that makes: skate shoes and skate clothing, surf and snow apparel. Earth makes: streetwear, gear for snowboarding. Element makes: boards, wheels, clothing and accessories. Emerica makes: skate shoe, clothes, videos. A member of Sole Technologies. Enjoi makes: boards and clothes. Es makes: skate shoes, clothes. A member of Sole Technologies. Etnies makes: clean, solid skate shoes. Check out thier site. Etnies is a part of Sole Technologies. Skateboard company that makes: electric skateboards and powerboards. Skateboard company that makes: Clothing, apparel. FDK makes: skate bearings, apparel. Foundation skateboard company that makes: boards, clothing. Fourstar makes: clothing, jackets, pants, shirts. Part of a Crailtap company. A girls skate and surf company, makes: shoes and clothing for girls. Girl brand makes: boards, clothing. Skateboard company that makes: skate shoe, clothing, videos and some other stuff. Grind King makes: trucks, clothing and hardware. Skate company that makes: clothes and accessories for girls. Skate company that makes: Decks, wheels, clothing, caps, beanies, backpacks and accessories. 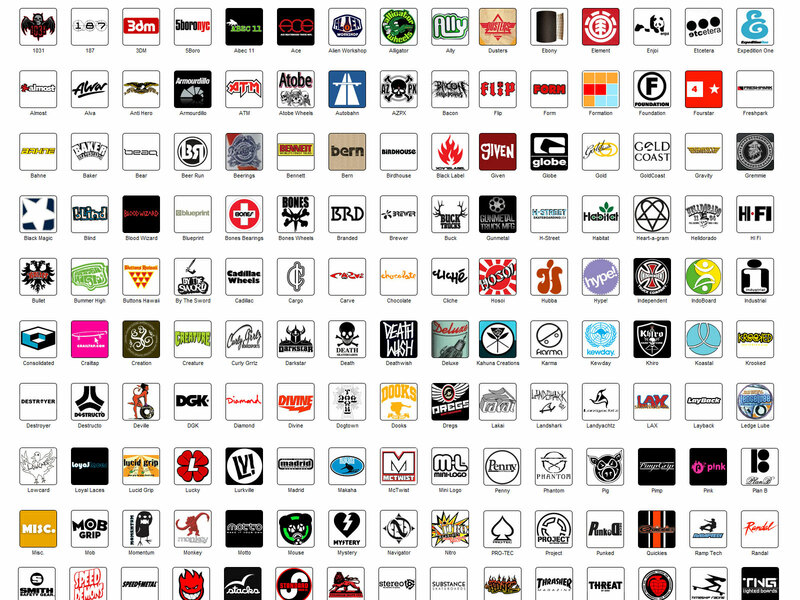 Hookups makes: decks, wheels, clothing and accessories. Skate company that makes: clothing. Skate company that makes: trucks, clothing and accessories. Krux makes: trucks, soft goods. Lakai makes: skate shoes, clothing, shirts, hats, pants. A part of Crailtap company. Mentality makes: decks, hoodies, shirts, wheels. Skate company that makes: board, wheel and trucks. Mystery makes: boards, wheels and clothing. Skate company that makes: skate shoes, clothing, shirts. Osiris makes: skate shoes, clothing. Phantom makes: skateboard trucks, accessories and clothing. Pig Wheels makes: wheels, clothes, accessories and more. Popwar skateboard company makes: decks. Powell makes: decks, wheels, clothings, accessories. Premium makes: boards, wheels and clothes. Quiksilver makes: clothing and accessories for skate, surf and snow. Reflex makes: bearings and accessories. Skateboarding company that makes: wheels. A part of NHS. Roxy girls brand for Quiksilver, make: skateboards and longboards, clothing. Royal makes: trucks and clothes. Part of Crailtap company. Skateboarding company that makes: decks, clothing. Skateboarding company that makes: decks, wheels and clothes. Shortys makes: skate gear, decks, hardwear, clothing. Sk8nuts makes: special hardware, threadlocking screws, and clothing. Speed Demons makes: wheels, bearings, boards, clothing and other accessories. Spitfire makes: wheels, clothing and accessories. Status makes: skate decks, wheels and clothes. Skateboarding company that makes: skateboards for younger riders, decks, wheels, helmets, pads. Thirdchoice makes: skateboarding gear and clothing company. Thunder makes: trucks. Part of a DLXSF brand. Toy Machine makes: boards, wheels, clothing, accessories. Vans makes: skate shoes, clothing, accessories. Zero makes: decks, accessories, hardware, clothing and wheels. Skateboarding company that makes: various skate gear and clothing.